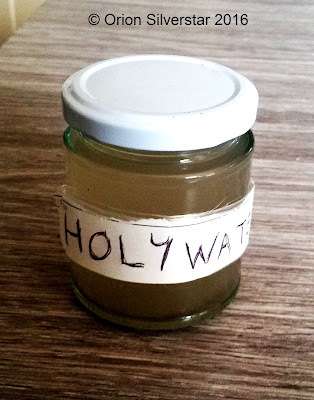 Before I go into how to make Holy Water I would like to talk a little bit about why it is important to have Holy Water as part of your ceremonial supplies. Some of the benefits of Holy Water are, Healing, Protection, Consecration (this means all your ritual/Magick tools should be consecrated before use). Exorcism, Cleansing, Calming Spirits, Blessings, Baptism (a ritual which originated in Egypt in relation to crossing into the afterlife), Circle Casting and more. These are just some examples of the uses of Holy Water and why those on the path of ceremonial ritual should have it in their supplies. 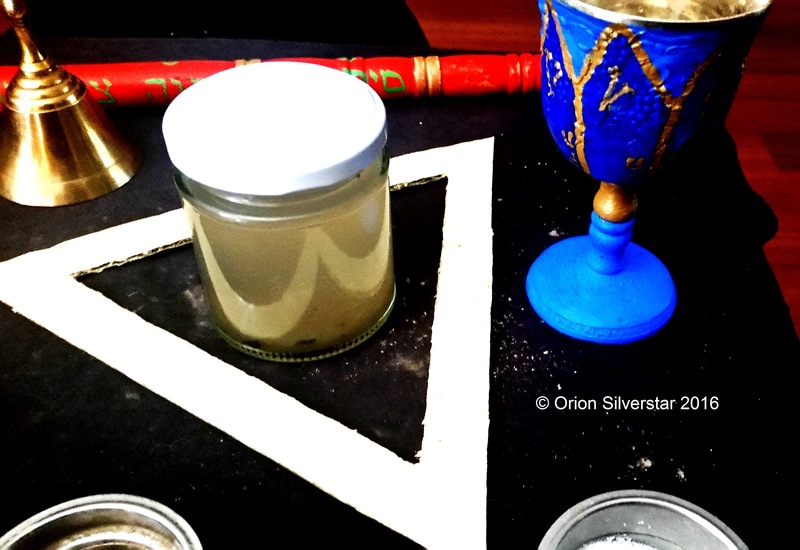 Also as I have mentioned before and can not stress enough the importance of making all of your ritual tools and supplies if that is possible to do so. There are different formulas of how to make Holy Water on the internet, however this is the method I use which will work just as good. This formula comes from Eliphas Levi in his book "Doctrine And Ritual Of Transcendental Magic" Except where mentioned, is my own ideas told to me from the spiritual beings I work with. 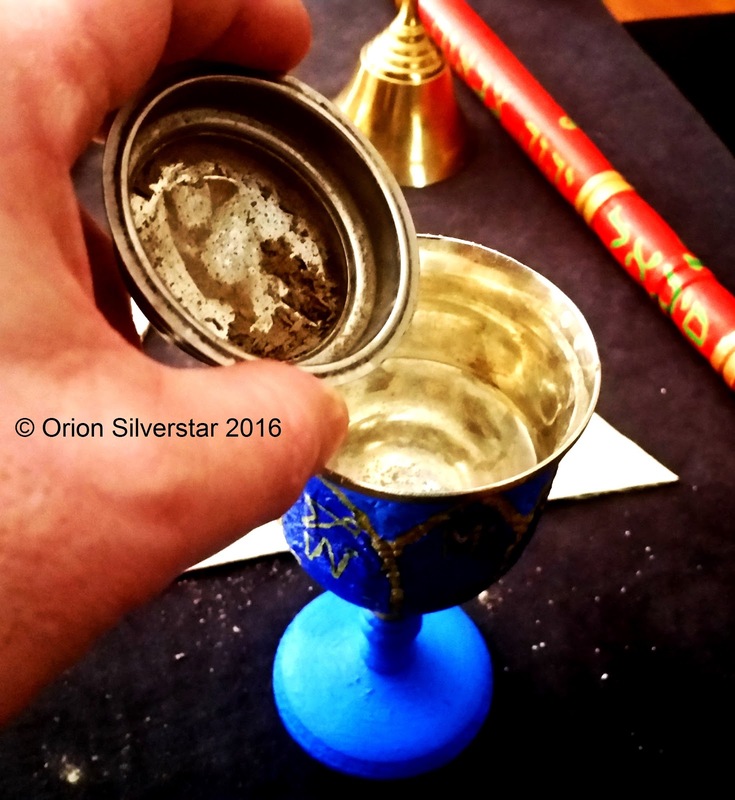 Things needed for the ritual : On the altar place (A) A goblet half full of water (B) Two saucers, one with Salt and one with Ash from (which is my own method : Frankincense and/or Myrrh incense, I use as it is the gifts given to the baby Christ by the Three Wise Men/Magi. It also has a connection with the Constellation Of Orion, Sirius and the Sun. All negative Entities/beings can not stand to be around Frankincense or/and Myrrh incense through my own experiences). (C) A container to put the blessed Holy Water in that is labeled for later use. Do The Lesser Banishing Ritual Of The Pentagram (see my other blog on how to do this). Do The Supreme Invoking Ritual Of The Pentagram (this is optional depending on your level of advancement, however I like to do this ritual as it empowers the ceremony all the more. I will point out that this ritual is very powerful and involves Enochian language from the Enochian Angels themselves. *As with all these rituals and techniques it pays to know all about them, how they work, why use them? The Angels involved, the meanings of the words used, plus good visualization skills before even trying to use them. These rituals and techniques above need to be mastered and committed to memory first before proceeding any further, except the optional rituals/techniques. May wisdom abide in the salt and may it preserve my mind and body from all corruption. May all phantoms depart from it so that it may become a heavenly salt, salt of the earth and earth of salt. May it feed the threshing ox and strengthen my hope with the horns of the winged bull ! So Mote It Be ! While saying these words visualize a bright white light passing out of your hand and into the salt, feel the energy leave your hand. May this ash return unto the fountain of living water, may it become fertile earth; may it bring forth the Tree Of Life. In the salt of eternal wisdom, in the water of preparation, in the ash whence the new earth springs forth, be all things accomplished unto the age of the ages. So Mote It Be! The preparation of the Holy Water is now complete, now put the Holy Water in a glass container and label it. If there is any spirits or Entities trapped within this my circle you will now be free to go in peace. 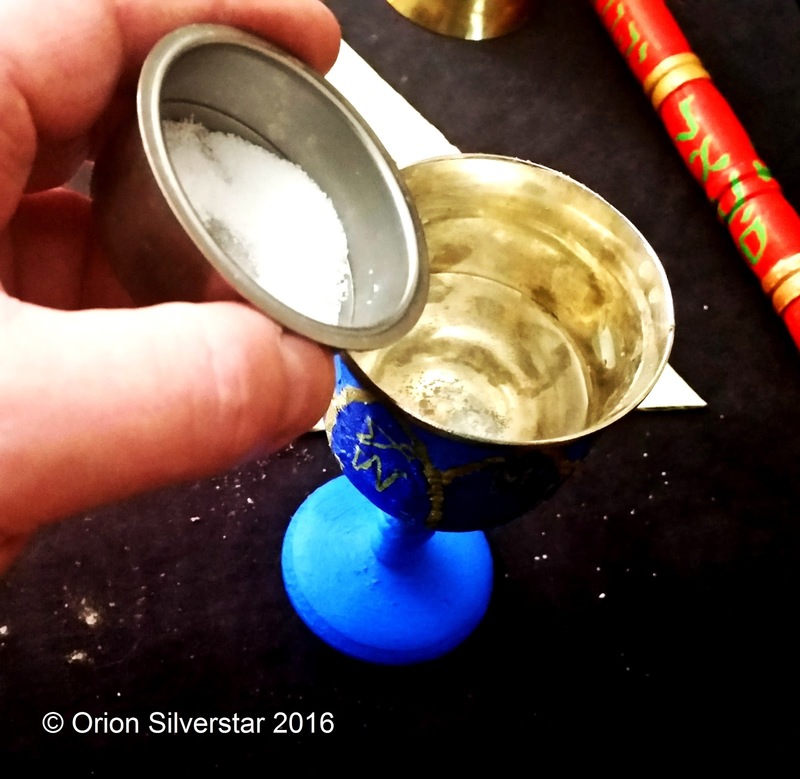 Do the Lesser Banishing Ritual Of The Hexagram (if the Supreme Invoking Ritual Of The Pentagram was performed this ritual is a must). The ritual is now complete. Notes : The Lesser Banishing Ritual Of The Pentagram - The Earth pentagram is used without a circle drawn around it. The Supreme Invoking Ritual Of The Pentagram - The appropriate invoking Elemental and Active Spirit Pentagrams are used with a circle drawn around them, along with the appropriate Zodiac signs.